We saw this poster in a bakery shop window back in 2015 when we were photographing Preston for our Preston Pride of Place Project. 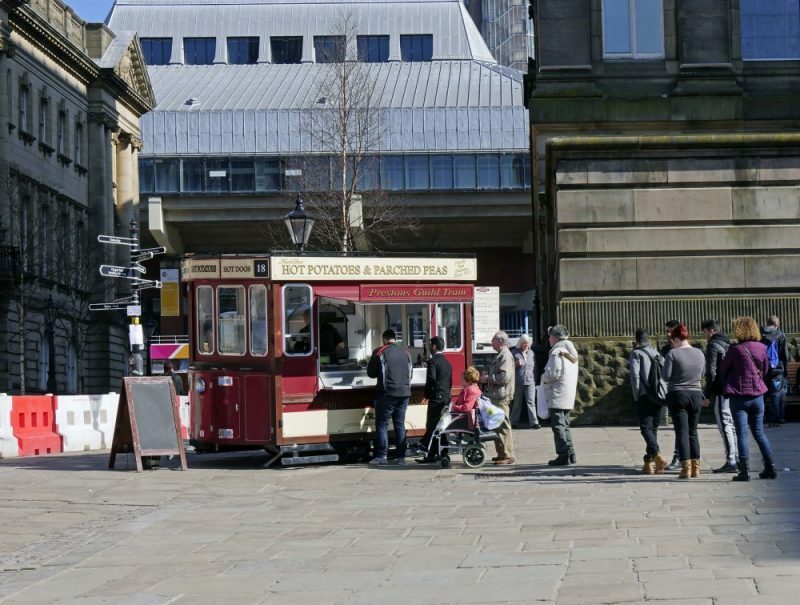 Our interest in local distinctiveness – and food – means that we’re usually keen to sample regional in/delicacies but we managed to resist this particular treat. It just seemed a little bit too stodgy somehow, so we settled for some hearty Parched Peas from the wagons on Flag Market instead. We’d never encountered Parched Peas before and learned that they are traditionally served with a splash of vinegar and / or chili sauce, and our lovely friend Barbara Molloy reckons you can’t beat mint sauce. Our Pie on a Barm! photo has attracted a variety of responses, particularly when we’ve displayed it in The Caravan Gallery in different parts of the UK. ‘What’s a barm?’ some people ask. ‘Shouldn’t it be ‘in’ not ‘on’?’, enquired a grammatical pedant. ‘Is that what they eat in the north?’ We’d love to know if the +40p supplement is really for butter but suspect it’s probably for marg. 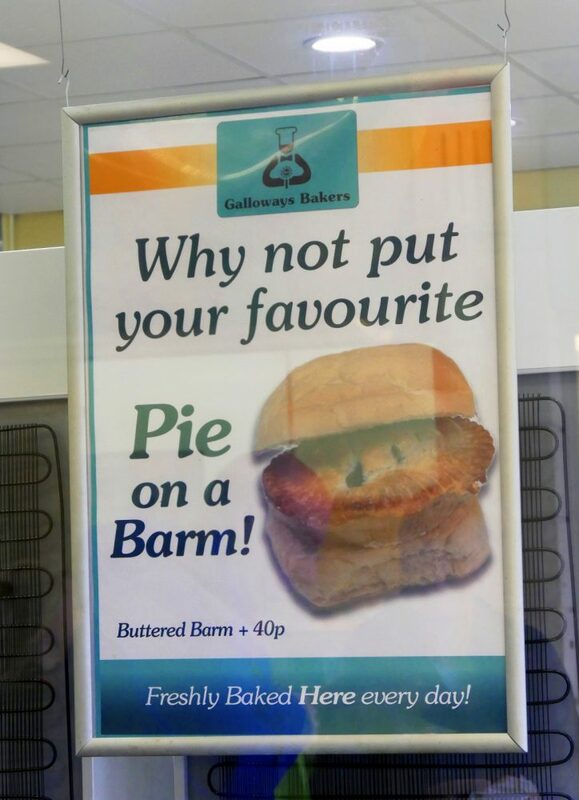 Anyway, we’d love some feedback from anyone who’s had a pie on a barm. How was it for you and would you do it again? 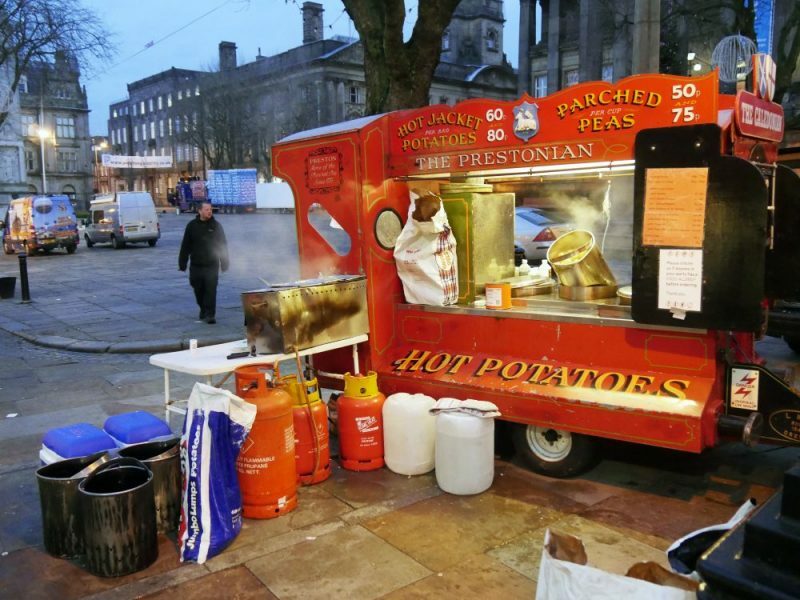 If you’re an actual or honorary Proud Prestonian you may like to join our Preston Pride of Place Project Facebook group.